Last weekend was the 009 Society’s East Midlands Group Members Day. I went two years ago and it was one of the things that started my 009 modelling. I was very pleased to go back again this year. There was a wide selection of layouts – 26(!) – with many different styles and themes. 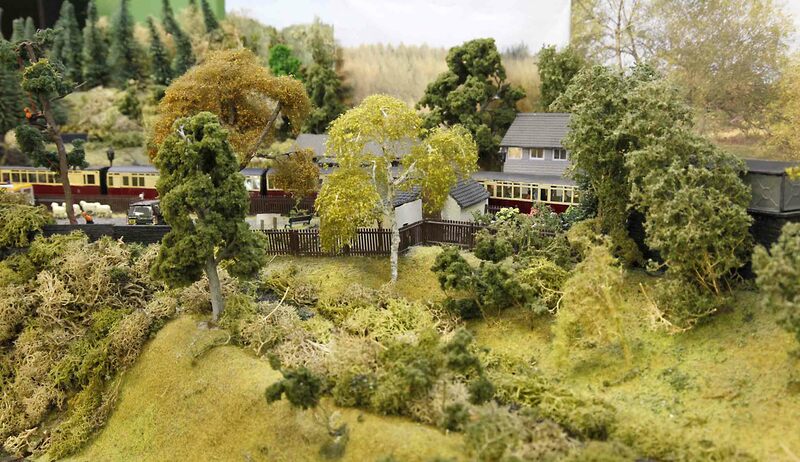 The atmosphere is relaxed and the modellers are friendly and helpful. The venue is great, with plenty of space to view the layouts. It was a very enjoyable day. … the beach and pier are fantastic. The Bailey Brothers have added a soundtrack of breaking waves and seagulls. 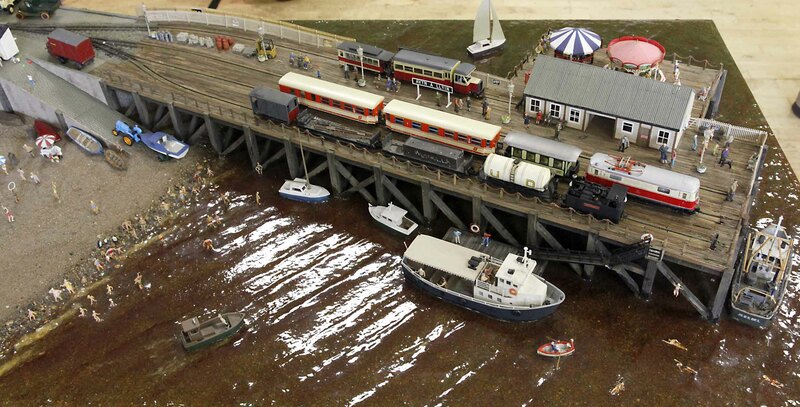 When I viewed the layout from baseboard level I really felt I was at the seaside. While the pier is impressive, there are lots of other well modeled details. I like this house. Brandgeight is a clever figure-of-eight layout by Peter Hardy. 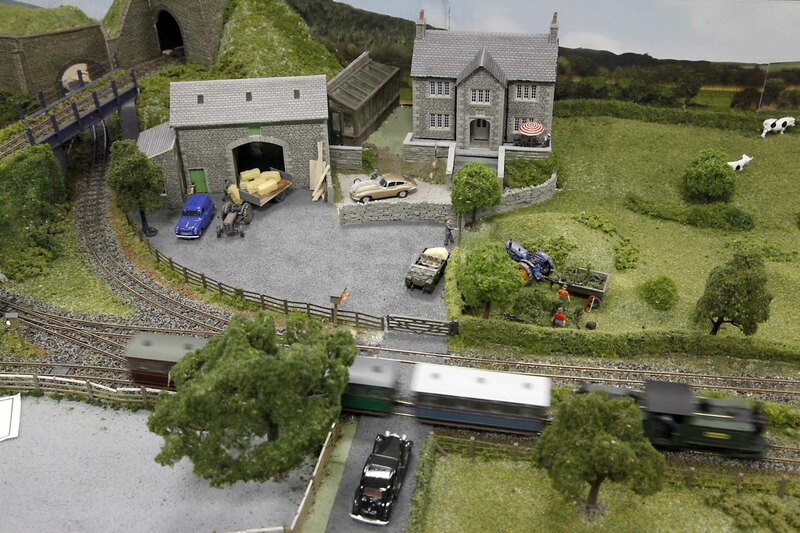 There are lots of interesting scenes throughout the layout, including soap suds on the E Type Jag. Oh, I was too slow to freeze the Fairlie! I got chatting with Peter and mentioned I was thinking of using Seep point motors. By coincidence he used them throughout this layout and he gave me some useful tips and tricks to get the best from them. Thanks Peter. 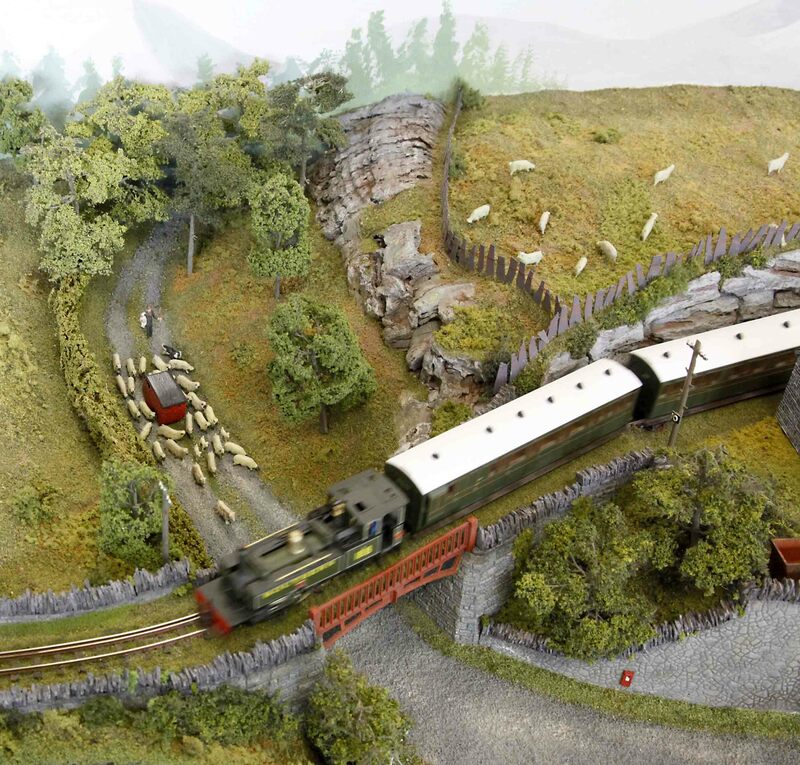 Tan-y-bwlch is a modern era Ffestiniog layout by Nigel Smith. 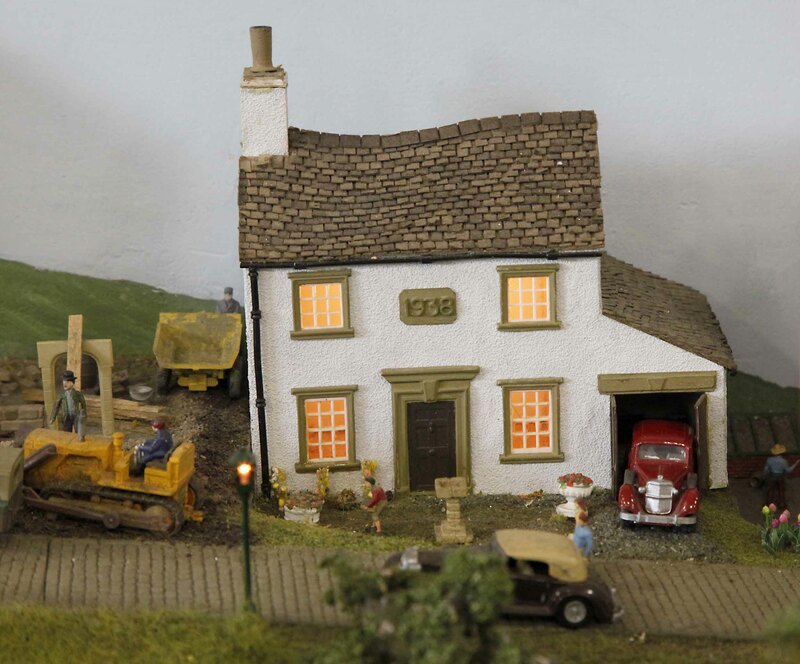 The modelling is very atmospheric. 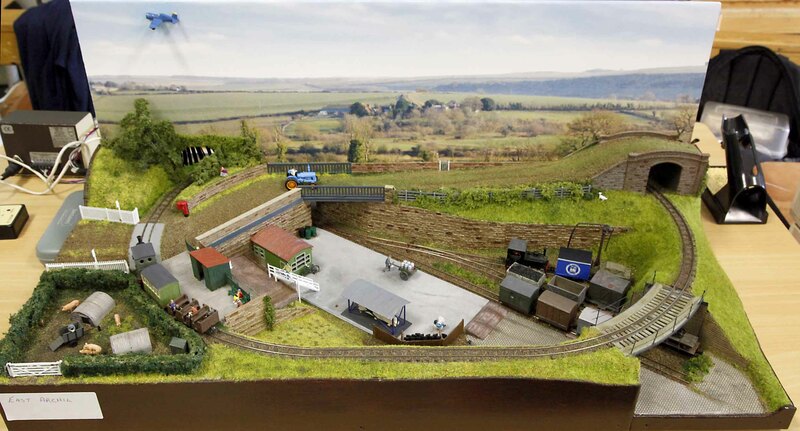 Nigel’s presented the layout at close to eye level. This gives interesting, natural-looking, viewpoints. Here the train and loco are partly obscured by the trees and water tank. Very realistic. From big to small. East Archil by Alan Martin has a loop and a terminus on a small board and is very neatly done. 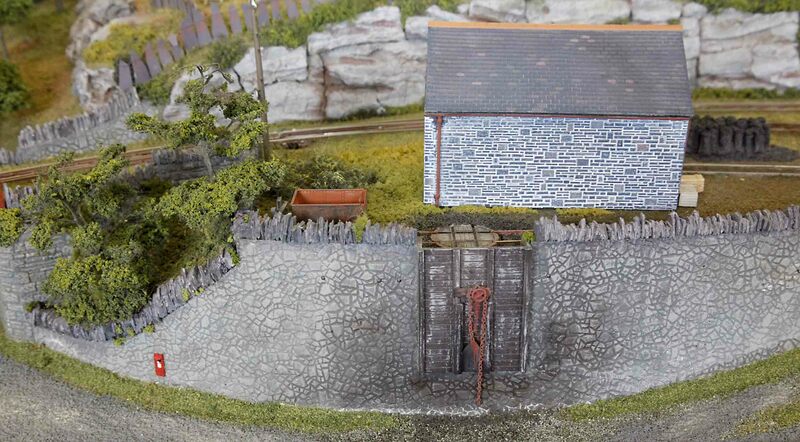 Nice to see a pig farm on a layout! 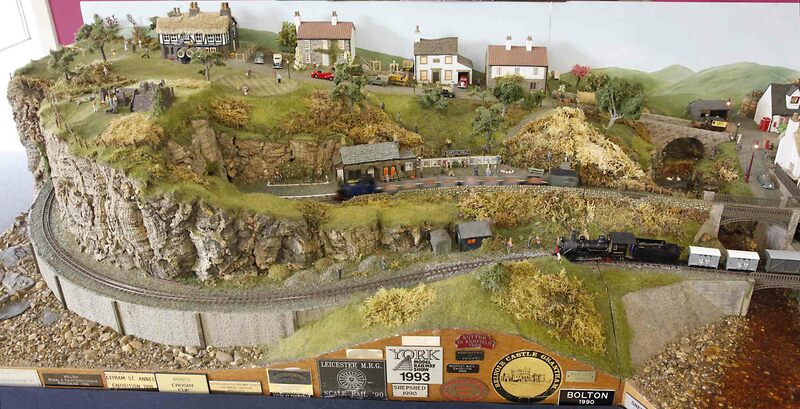 Back to one of the larger layouts, Tan-yr-Allt by Roger Christian. 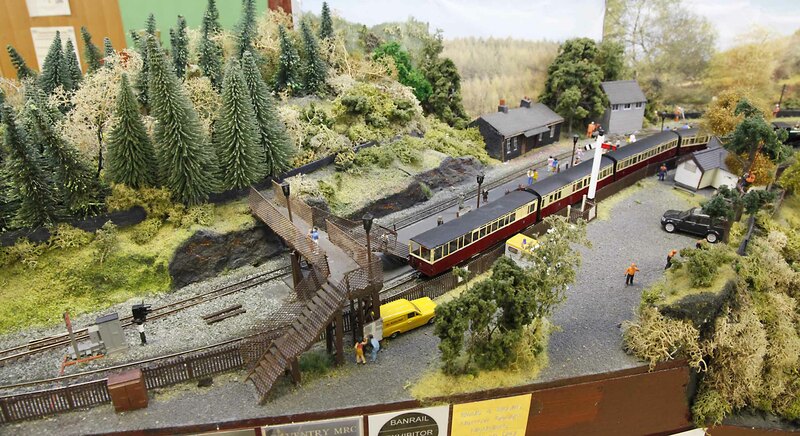 It is part of a larger Ffestiniog layout. It is a very nice layout and I spent a long time looking at it. I’d like to see the whole thing! Roger and Stan Williams were running ‘themed passenger trains’ from the L&B, GVT and Ffestiniog, which was enjoyable to watch. Here the L&B train speeds past a car surrounded by a herd of sheep. This mountain, bridge and stream are very atmospheric. Regular readers will know I like a layout with nice detailing. I was impressed by the work that had gone into creating this coal shoot. The modelling is so good and so natural. 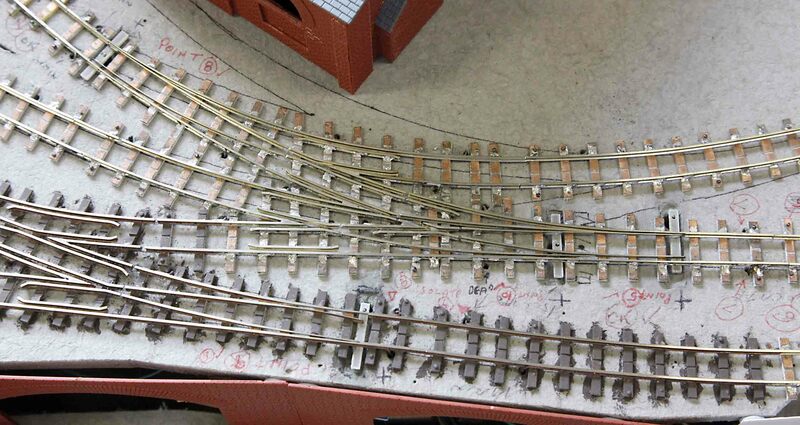 I wonder how many people don’t notice this great detailing when they look at the layout. One of the nice things about Member’s Days is people bring their partly completed projects. 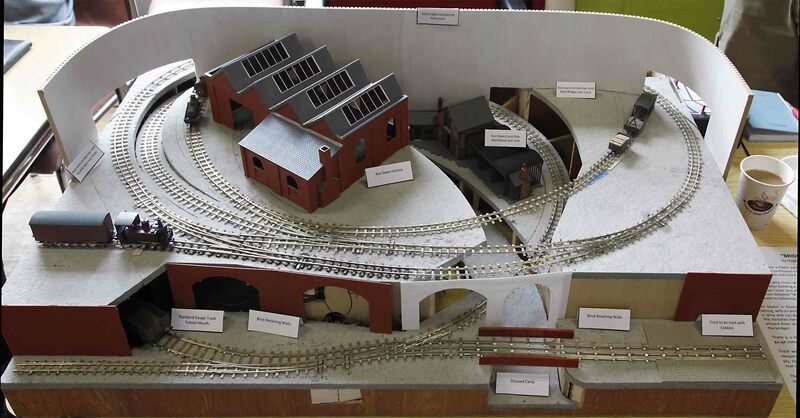 This is Bridges by Hugh Milwards, a layout with two interconnected levels, dual gauge track in the foreground and some compact, complex point work on the upper level. How did Hugh fit such a lot into such a small space? Take a look at this handmade track. Amazing! It was really interesting and instructive to see the layout at this stage, before the scenery disguises the construction details. A great opportunity to learn from an expert. As well as 26 layouts there were five traders! I found several irresistible things in the 009 Society Sales rummage boxes and on the A1 Models stand – but that’s a story for another day! Well done to the East Midlands Group for organising such a great event.